I seem to like starting new projects. Not that I actually complete them all (see: weekly photo plan). So, in that spirit, I’ve got a new project—this time in the cocktail realm. Last fall my friend Rie gave me a great cocktail gift in a small book called Lommebogen (link is in Danish). It is a photocopy of bartender Axel Sørensen’s personal bar notes from the 1930s. (Lommebogen translates as “the pocket notebook” from Danish.) He worked at the now long-closed bar Café de la Reine along the lakes of Copenhagen (for Copenhageners, this was at Søtorvet, by Dronning Louises Bro). It contains the recipes of his trade. Blending history and cocktails combines two things I love. As I looked through Axel’s recipes I couldn’t help wanting to look up modern incarnations and tracking down what was happening in bartending at that time. Now, for cocktail buffs, the 1930s are a pretty big decade. 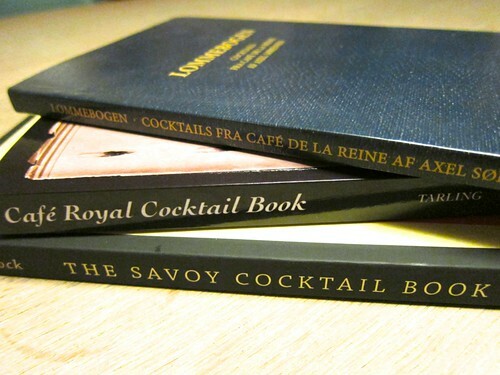 There are two other historic cocktail books now widely available from that period, Harry Craddock’s The Savoy Cocktail Book and the Café Royal Cocktail Book, compiled by W. J. Tarling. Both of these come from London bars of the period. (Harry Craddock was actually an American who moved to London so he could keep bartending during prohibition.) There is also a little bit of a trend, which follows from the whole Julie and Julia thing, for people blogging their way through a book of cocktail recipes. I’ve definitely read through a lot of Erik Ellestad’s posts on Savoy Stomp. So, yep, I’m going to do some cocktail mixing and blog post writing. Now, I’m not really up for doing every single recipe in Lommebogen. I have a little bit of a different tack. Remember I said there were two well known books from the same period as Lommebogen? Well, I went ahead and got my hot little hands on copies of those two as well. Yes, real paper and all. I’ve gone through Lommebogen and cross-referenced it to find the recipes that appear in all three books. There are about 40 or so recipes that fall into that list. I’m going to make all of those, and compare and contrast the recipes. Should be an interesting journey. In addition to the popular cocktails of the day in the 1930s, Axel had a decent number of what are probably “local/regional” cocktails. There are a few that have Danish or German names, and do not appear elsewhere at that time that I can find. Once I’ve gone through the main cocktails from all three books, I’m going to circle back to the local cocktails that people had probably never heard of in England. You can read more about how I went about this project and all of the posts from it in the Lommebogen Ground Rules post. Let the cocktail history experiment begin!